We hold many programs and provide different services for the clients at the Fayette Blind Association. Patch Power is a new program that began in the fall of 2017. Patch Power provides supporting information to parents of children with amblyopia along with fun activities for the kids to help them comply with treatments. In addition Patch Power provides assistance for children who have been newly prescribed eyeglasses. It can be a struggle for parents to help their children understand how important it is to follow the doctor's treatment plan by wear the patch or eyeglasses. Our program will include fun incentive activities for the children and support for the parents. For information on Patch Power, call Kylie at 724-437--2791. Once a month we assist our clients food needs by helping them with a task that can be very difficult for them to manage. Produce to People is the Food Bank’s large-scale produce distribution program. Each family receives 30-45 pounds of food, mostly fresh produce. Produce to People is an additional resource for our clients who have difficulty when their food supply ends before the month does. Getting to the Fayette County Fairgrounds and waiting in the long line to pick up the food in all kinds of weather is a daunting task for clients. Our staff has developed a partnership with the Produce to People staff so that we are able to pick up the food for our clients and deliver it directly to them! This is a great help as you can read from the comments below. "Since my vision diagnosis, I haven't been able to get out as much. The Fayette Blind Association offered me the Produce to People Program. I thought I'd have to find a way to go and pick it up, but to my surprise, they picked up my produce and delivered the box right to my front door! Thanks FCAB!" "I lost my leg due to my diabetes and I'm not able to get around as I once did. Fayette Blind Association offered the Produce to People Program. To my happiness and gratefulness, I receive a delivered surprise box of the most beautiful produce once a month." "I couldn't get to the fairground every month, but with the help of the Fayette Blind Association and the monthly Produce to People Program, I get my food delivered to my building every month with a smile!" The Bowling League had another great year and will begin again in January 2019. For 12 weeks during the winter months, clients bowl weekly as an activity in physical fitness, coordination, or as a fun social gathering. We support this activity by providing the funds for the entire league. Each January brings the start of the bowling league activity to our clients. Each Friday the teams bowl and compete against each other. The activity ends in May with a celebration event! Clients who are interested in bowling should call 724-437-2791 for more information. Limited transportation is provided. Yes We Can was chosen as the new name for the activity group of visually impaired clients who feel that they CAN do just about anything. The group holds weekly activities that range from picnics, to walking, to music appreciation and meditation. These activities are designed to provide social interaction for clients and to promote physical activity, independence, and a general feeling that anything is possible, even with a vision problem. Join the group as they hold weekly activities. Call 724-437-2791 and press 5 to leave a message if you would like more information on the Yes We Can group activities! 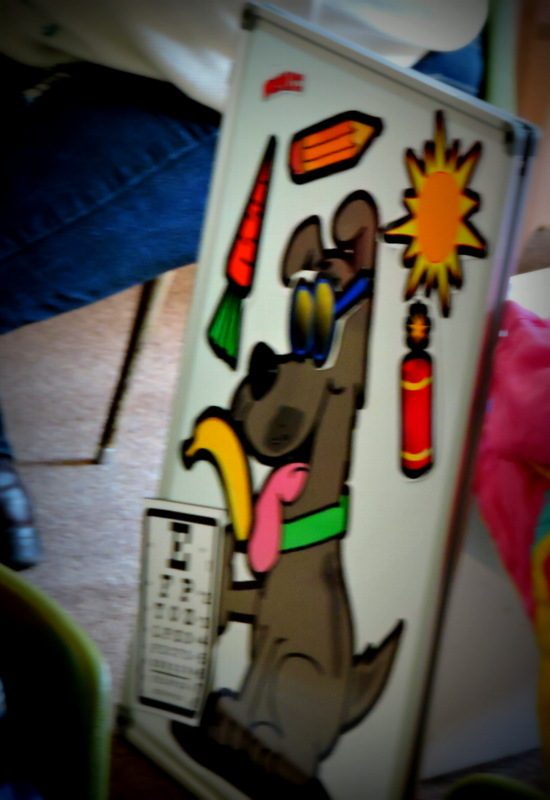 Reckless, the Seeing Eye Dog is just one of the education programs that we offer on eye safety for children. This eye safety program is offered to elementary school children. If your school is interested, call our agency for more information. In the Spring of 2018, the Fayette County Association for the Blind was awarded a grant from the Community Foundation of Fayette County to help cover some the costs of child vision screenings. A grant from the Community Foundation of Fayette County, PA was presented to our agency to assist with costs of vision screenings. We offer education programs focusing on prevention of eye injuries and eye safet as well as child vision screenings throughout the community. Our Activity Group has participated in bowling, art, exercise, pottery, container gardening, and more. We provide programs for blind and vision impaired adults throughout the community. Dress to Impress is just one of the programs offered to our clients. This 4 week program's message was "Look good, Feel Good". Clients were provided with skills in personal grooming, self-advocacy, and self esteem. At the end of the program clients received a shopping experience through donated gift cards that allowed them to shop for a new outfit--which they wore to the celebration luncheon. Call our agency if you are interested in joining any activities. Our winter bowling league is one of the most popular activities. "The Bowling League gets me out of the house in the winter, and keeps me active. It's a great time with friends, and it keeps me from being depressed all winter long." Jim, Client. We provide vision screenings for adults throughout the community. Finding a vision problem early is important in adults too. Using the Amsler Grid, we can help detect Age Related Macular Degeneration and refer an adult for treatment. As it is in children, finding a vision problem early is essential to better eyesight. Although the eye care professional may not be able to stop the progression of an eye disease, by our agency referring an adult to a medical professional, it may be possible to slow the progression of the disease. We provide free vision screenings for children and adults! When was your last eye exam? We advocate for everyone to receive a complete eye exam annually. Stop by our office for a free vision screening that can help detect vision problems.